Today is Pi Day and Virtual Potluck is celebrating with pie, of course! Since I actually have two degrees in math and my stepdaughter is working on her PhD, I can’t let this “holiday” go by unnoticed. 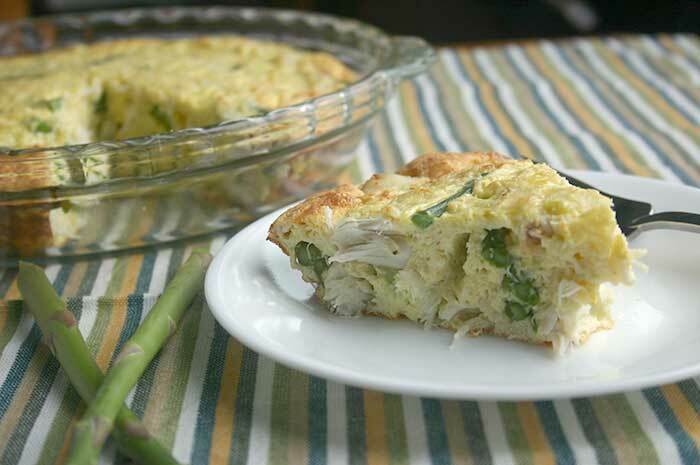 I’m bringing a savory crustless crab quiche with asparagus to the party. I made this crustless crab quiche for breakfast one morning and I think The Grillmaster had it for breakfast, lunch, AND dinner that day. It’s even better the day after you make it and easily reheats in the microwave. Use jumbo lump crab meat if you can find it (and if you can afford it). I made this crustless crab quiche for breakfast one morning and I think The Grillmaster had it for breakfast, lunch, AND dinner that day. It's even better the day after you make it and easily reheats in the microwave. Use jumbo lump crab meat if you can find it (and if you can afford it). Preheat oven to 350°F. Spray a 9-inch deep dish pie plate with cooking spray and set aside. Whisk together eggs and egg substitute in a large bowl. Whisk together baking mix and half and half in separate medium bowl. Add flour mixture to eggs and whisk until smooth. Stir in asparagus, cheese, onions, salt and pepper. Gently stir in crab, taking care not to break up the lumps. Pour mixture into prepared pie plate. Bake 45 to 50 minutes or until center is set. Cool in dish on wire rack for 15 minutes before cutting into wedges. 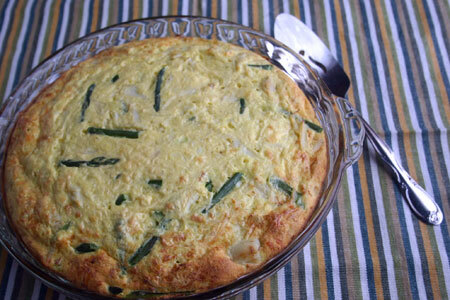 This quiche is a good source of Vitamin B12, Selenium, Protein, Calcium, Phosphorus and Zinc. If you are watching your Cholesterol, you might want to use 1-1/2 cups total egg substitute and skip the whole eggs. Disclaimer: Items in the prize package were contributed by Good Cook, Oh Nuts, Zak Designs, Beanilla, Wholesome Sweeteners, and My Spice Sage. I received no compensation for this post and all opinions are my own. Looks so delicious! I love crab and asparagus. Plan to try this soon! This would be so great for brunch! This looks great Shelby. I love quiche and would totally make this crustless version. I love this Shelby! Asparagus is our favorite and the boys would totally love the crab! Oh this is one of your best! Sounds scrumptious. Adding the necessary ingredients to my grocery list. What a delicious recipe to celebrate Spring, whatever the calendar says I’m ready to enjoy this recipe 3 meals a day! I, too, would eat this quiche for breakfast, lunch and dinner, probably for a couple of days straight, too. Allergic to crab, how about tuna or salmon? Hi Adrienne – Sounds good to me!